In my ongoing effort to communicate my philosophy/ideology and the consequent imperatives… though I am no closer than I was yesterday, I have found a book which may communicate much of the same. It’s bizarre, even some of the terms and chapters are the same. I do not wish to divulge the name of the publication, as I have yet to give it a proper read through, and who knows where the author and I agree, and where we diverge. Nonetheless, it is exciting to see someone else find the triangle in the dark, the exoplanet beyond the distant suns. 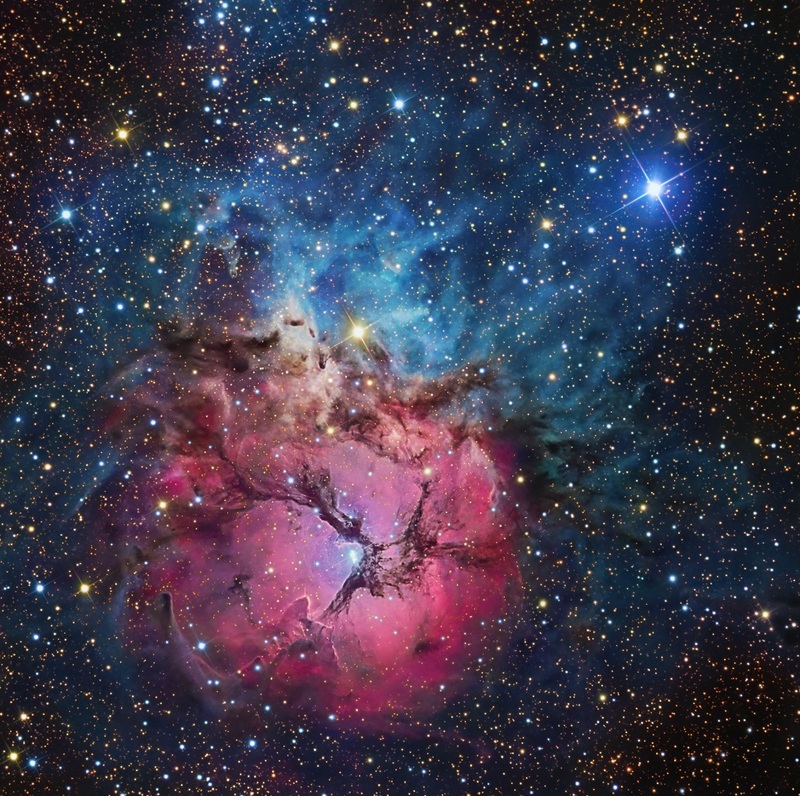 Speaking of Cosmic beings, and the stars in the great beyond, here is a picture of The Trifid Nebula, with an explanation of Nebula below from Reddit.com user PixInsightFTW. “The general rule: when you see a dusty nebula, a cloud looking thing, it’s gas and dust, not millions of stars. When you see a galaxy picture, that’s where the ‘white fuzzy bits’ are billions of stars. Except for our close neighbors, The Andromeda Galaxy and the Large and Small Clouds of Magellan, we’re not going to be able resolve individual stars… unless they go supernova and outshine the whole galaxy! On to something deeper than the above; from beyond the stars, to beyond our cranium, into our neurons, and the mind that emerges therefrom. I am just about as big of a fan of Sam Harris as I am of Joe Rogan. No matter how you cut it, this is an interesting conversation. They cover such things as the mind, the idea of the soul, of good and evil, politics, human life, normativity, and all things in between and beyond. I really love these two. This entry was posted in atheism, God, Joe Rogan, JRE, philosophy, Podcast, religion, sam harris, Space, video and tagged atheism, atheist, atheists, ethics, god, good and evil, joe rogan, JRE, morality, normative ethics, philosophy, podcast, right and wrong, sam harris, science, space, The Trifid Nebula. Bookmark the permalink.